Jim Magilton was manager of QPR from June 2009 to December 2009. His time at the club was short, typical of those turbulent days, but many Rangers fans still remember his time in charge as being positive and credit him with playing some of the best football seen from the team in recent years. These days Jim is employed as Elite Performance Director at the Irish Football Association in Belfast. I caught up with him at his office in Windsor Park during a break in his busy schedule and put to him a number of questions kindly supplied by Steve Russell. Q: The biggest game during your time in charge was probably the cup game against Chelsea at Stamford Bridge. QPR lost narrowly in a tight contest with nearly 6,000 R’s fans in attendance. What are your memories of that match? A: Jim knew that this game was huge for the fans being a local derby. Family members were there and the atmosphere was electric. The team were on a good run at the time and Jim stressed to the players that they should express themselves and play with confidence, attacking Chelsea from the start. He deliberately overloaded the midfield to try to choke off the threat from Chelsea’s flair players and stop them taking control. It was a measure of the quality in the Chelsea team, even then, that their goals were scored by Lampard and Ballack. During the post-match hospitality he was greeted warmly by Phil Scolari, who paid him the great compliment of saying that QPR had been by far the most positive and attack-minded team that had visited Stamford Bridge that season. Scolari, who was accompanied by Ray Wilkins, who was also a very generous host, and plied assistant manager John Gorman with copious amounts of vintage Scotch! Q: Many fans were disappointed that Ale Faurlin left the club earlier in the year, a fans favourite, what did you think of him as a player and as a person? A: Jim loved him as a player and person, technically brilliant and a very intelligent footballer. Even with his limited grasp of English in those early days, it was clear that he was a quick learner and instinctive footballer, quickly grasping instructions. Ale was recommended to Jim and assistant John Gorman by an agent and during pre-season they watched him closely over a five-day period. During that period the Harlington training ground wasn’t available and the team used a nearby cricket ground for training. During practice matches on the immaculate grass surface it was clear that Ale would be an outstanding addition to the squad. Jim saw that Ale would be instrumental in getting the best out of Adel by getting the ball to him in advanced positions. Jim stressed that his policy was always to watch a player closely before signing, possibly due to his time at Southampton when the infamous ‘George Weah’s cousin’ debacle happened. Q: Your first game in charge was against Blackpool at Loftus Road who were then managed by Ian Holloway. Do you remember meeting him that day? A: Jim has always had great admiration for Ollie as a player and manager and someone who has been very kind and supportive of him through his playing and coaching career. He joked that Ollie was the kind of aggressive player who would kick you from one end of the field to the other for 90 minutes, then chase you to the toilets afterwards and kick you there too! Ollie’s team that season was a reflection of his footballing philosophy and contained a lot of quality players including the impressive Charlie Adam. You could see they were destined for greater things that season and in that first game QPR managed to scrape an undeserved point with a scrappy late equaliser from Peter Ramage. Ollie was terrific company, both before and after the game, full of warmth and had everybody in his company entertained with his endless flow of wit and wisdom. Q: Adel Taarabt was there during your time at QPR. As we know, a wasted talent, but how did you get on with him? A: Jim described Adel as a genius with flaws and one of the most outstanding footballing talents he has ever seen. His balance, quick thinking and footwork were outstanding. If you remember that Jim played alongside Matt Le Tissier at Southampton that is a big compliment indeed. Jim actually tried to sign him on loan when he managed Ipswich, but Harry Redknapp warned Jim that he would end up tearing his hair out trying to manage this flawed genius! Jim felt that he had a good relationship with Adel by concentrating solely on his football development, while leaving John Gorman to be the father figure and letting Gianni Paladini to look after any off-field issues. Adel’s team-mates were tolerant of his many flaws since everyone recognised this footballing genius and his ability to be a match winner on his own. It is obvious that Jim looks back on his time at QPR with some fondness. Even the sometimes-difficult relationship with the owners didn’t take too much away from the pleasure he got from working with some extremely talented players. Incidentally, when going into Windsor Park to meet Jim, I bumped into another ex-Ranger, Stephen Lynch who also works for the IFA. Stephen told me of his love of the club and shirt and he also did a very interesting interview a few years ago with Steve Russell. 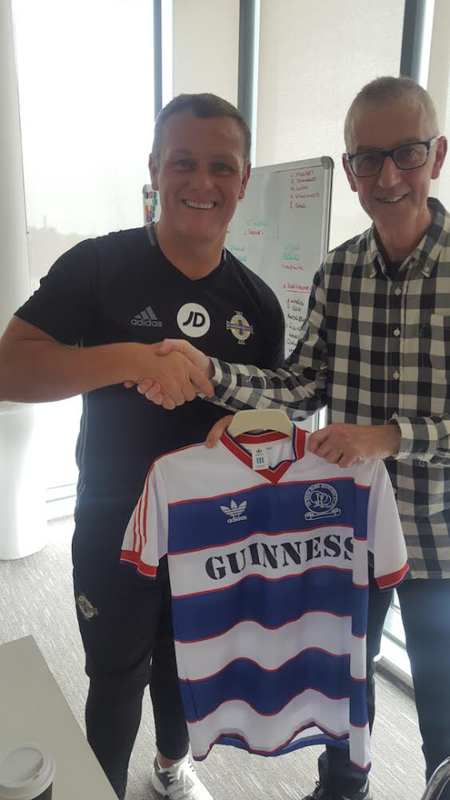 The Guinness shirt shown in the above photo is quite appropriate as that is the kit that Stephen would have worn in his QPR playing days in the 1980’s.